Lillian Diana Gish (October 14, 1893 – February 27, 1993) was an American actress of the screen and stage, as well as a director and writer. Her film acting career spanned 75 years, from 1912, in silent film shorts, to 1987. Gish was called the First Lady of American Cinema, and is credited with pioneering fundamental film performing techniques. Gish was a prominent film star from 1912 into the 1920s, particularly associated with the films of director D. W. Griffith, including her leading role in the highest-grossing film of the silent era, Griffith's seminal The Birth of a Nation (1915). At the dawn of the sound era, she returned to the stage and appeared in film infrequently, including well-known roles in the controversial western Duel in the Sun (1946) and the offbeat thriller The Night of the Hunter (1955). She also did considerable television work from the early 1950s into the 1980s and closed her career playing opposite Bette Davis in the 1987 film The Whales of August. In her later years Gish became a dedicated advocate for the appreciation and preservation of silent film. Gish is widely considered to be the greatest actress of the silent era, and one of the greatest actresses in cinema history. Despite being better known for her film work, Gish was also an accomplished stage actress, and she was inducted into the American Theatre Hall of Fame in 1972. Gish was born in Springfield, Ohio, the first child of Mary Robinson McConnell (1876–1948) (an Episcopalian) and James Leigh Gish (1873–1912) (who was of German Lutheran descent). Lillian had a younger sister, Dorothy, who also became a popular movie star. The first several generations of Gishes were Dunkard ministers. Gish's father was an alcoholic and left the family. Gish's mother took up acting to support them. The family moved to East St. Louis, Illinois, where they lived for several years with Lillian's aunt and uncle, Henry and Rose McConnell. Their mother opened the Majestic Candy Kitchen, and the girls helped sell popcorn and candy to patrons of the old Majestic Theater, located next door. The girls attended St. Henry's School, where they acted in school plays. In 1910 the girls were living with their aunt Emily in Massillon, Ohio, when they were notified that their father, James, was gravely ill in Oklahoma. Seventeen year old Lillian traveled to Shawnee, Oklahoma, where James's brother Alfred Grant Gish and his wife, Maude, lived. Her father, who by then was institutionalized in the Oklahoma Hospital for the Insane in Norman, was able to travel the 35 miles to Shawnee and the two got reacquainted. She stayed with her aunt and uncle and attended Shawnee High School there. Her father died in Norman, Oklahoma, in 1912, but she had returned to Ohio a few months before. When the theater next to the candy store burned down, the family moved to New York, where the girls became good friends with a next-door neighbor, Gladys Smith. Gladys was a child actress who did some work for director D. W. Griffith and later took the stage name Mary Pickford. When Lillian and Dorothy were old enough, they joined the theatre, often traveling separately in different productions. They also took modeling jobs, with Lillian posing for artist Victor Maurel in exchange for voice lessons. In 1912, their friend Mary Pickford introduced the sisters to Griffith and helped get them contracts with Biograph Studios. Lillian Gish would soon become one of America's best-loved actresses. Gish, who was 19 years old at the time, told casting directors she was 16. Gish made her stage debut in 1902, at The Little Red School House in Risingsun, Ohio. From 1903 to 1904, Lillian toured in Her First False Step, with her mother and Dorothy. The following year, she danced with a Sarah Bernhardt production in New York City. After 10 years of acting on the stage, she made her film debut opposite Dorothy in Griffith's short film An Unseen Enemy (1912). At the time established thespians considered "the flickers" a rather base form of entertainment, but she was assured of its merits. Gish continued to perform on the stage, and in 1913, during a run of A Good Little Devil, she collapsed from anemia. Lillian would take suffering for her art to the extreme in a film career which became her obsession. 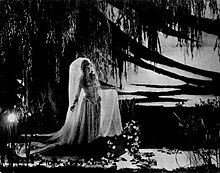 One of the enduring images of Gish's silent film years is the climax of the melodramatic Way Down East, in which Gish's character floats unconscious on an ice floe towards a raging waterfall, her long hair and hand trailing in the water. Her performance in these frigid conditions gave her lasting nerve damage in several fingers. Similarly, when preparing for her death scene in La Bohème over a decade later, Gish reportedly did not eat and drink for three days beforehand, causing the director to fear he would be filming the death of his star as well as of the character. Lillian starred in many of Griffith's most acclaimed films, including The Birth of a Nation (1915), Intolerance (1916), Broken Blossoms (1919), Way Down East (1920), and Orphans of the Storm (1921). Griffith utilized Lillian's expressive talents to the fullest, developing her into a suffering yet strong heroine. Having appeared in over 25 short films and features in her first two years as a movie actress, Lillian became a major star, becoming known as "The First Lady of American Cinema" and appearing in lavish productions, frequently of literary works such as Way Down East. She became the most esteemed actress of budding Hollywood cinema. She directed her sister Dorothy in one film, Remodeling Her Husband (1920), when D. W. Griffith took his unit on location. He told Gish that he thought the crew would work harder for a girl. Gish never directed again, telling reporters at the time that directing was a man's job. Unfortunately the film is now thought to be lost. In 1925 Gish reluctantly ended her work with Griffith to take an offer from the recently formed MGM which gave her more creative control. MGM offered her a contract in 1926 for six films, for which she was offered 1 million dollars ($13.4 million in 2015 dollars). She turned down the money, requesting a more modest wage and a percentage so that the studio could use the funds to increase the quality of her films — hiring the best actors, screenwriters, etc. By the late silent era, Greta Garbo had usurped Gish as MGM's leading lady. Her contract with MGM ended in 1928. Three films with MGM gave her near-total creative control, La Bohème (1926), The Scarlet Letter (1926), and The Wind (1928). The Wind, Gish's favorite film of her MGM career, was a commercial failure with the rise of talkies, but is now recognized as one of the most distinguished works of the silent period. Though not a box-office hit as before, her work was respected artistically more than ever, and MGM pressed her with offers to appear in the new medium of sound pictures. Her debut in talkies was only moderately successful, largely due to the public's changing attitudes. Many of the silent era's leading ladies, such as Gish and Pickford, had been wholesome and innocent, but by the early 1930s (after the full adoption of sound and before the Motion Picture Production Code was enforced) these roles were perceived as outdated. The ingenue's diametric opposite, the vamp, was at the height of its popularity. Gish was increasingly seen as a "silly, sexless antique" (to quote fellow actress Louise Brooks's sarcastic summary of those who criticized Gish). Louis Mayer wanted to stage a scandal ("knock her off her pedestal") to garner public sympathy for Gish, but Lillian didn't want to act both on screen and off, and returned to her first love, the theater. She acted on the stage for the most part in the 1930s and early 1940s, appearing in roles as varied as Ophelia in Guthrie McClintic's landmark 1936 production of Hamlet (with John Gielgud and Judith Anderson) and Marguerite in a limited run of La Dame aux Camélias. Of the former, she said, with pride, "I played a lewd Ophelia!" Returning to movies, Gish was nominated for the Academy Award for Best Supporting Actress in 1946 for Duel in the Sun. The scenes of her character's illness and death late in that film seemed intended to evoke the memory of some of her silent film performances. She appeared in films from time to time for the rest of her life, notably in Night of the Hunter (1955) as a rural guardian angel protecting her charges from a murderous preacher played by Robert Mitchum. She was considered for various roles in Gone with the Wind ranging from Ellen O'Hara, Scarlett's mother, which went to Barbara O'Neil, to prostitute Belle Watling, which went to Ona Munson. Gish made numerous television appearances from the early 1950s into the late 1980s. Her most acclaimed television work was starring in the original production of The Trip to Bountiful in 1953. She appeared as Dowager Empress Maria Feodorovna in the short-lived 1965 Broadway musical Anya. In addition to her later acting appearances, Gish became one of the leading advocates of the lost art of the silent film, often giving speeches and touring to screenings of classic works. In 1975, she hosted The Silent Years, a PBS film program of silent films. She was interviewed in the television documentary series Hollywood: A Celebration of the American Silent Film (1980). Gish received a Special Academy Award in 1971 "For superlative artistry and for distinguished contribution to the progress of motion pictures." In 1979, she was awarded the Women in film Crystal Award in Los Angeles In 1984, she received an American Film Institute Lifetime Achievement Award, becoming only the second female recipient (preceded by Bette Davis in 1977) and the only recipient who was a major figure in the silent era. She has a star on the Hollywood Walk of Fame at 1720 Vine Street. Her last film role was appearing in The Whales of August in 1987 at the age of 93, with Vincent Price, Bette Davis, and Ann Sothern, in which Davis and she starred as elderly sisters in Maine. Gish's performance was received glowingly, winning her the National Board of Review Award for Best Actress. At the Cannes festival Lillian won a 10-minute standing ovation from the audience. Some in the entertainment industry were angry that Gish did not receive an Oscar nomination for her role in The Whales of August. Gish herself was more complacent, remarking that it saved her the trouble of "losing to Cher." Her final professional appearance was a cameo on the 1988 studio recording of Jerome Kern's Show Boat, starring Frederica von Stade and Jerry Hadley, in which she affectingly spoke the few lines of The Old Lady on the Levee in the final scene. The last words of her long career were, "Good night." Gish starred in an episode of the popular CBS radio series "Suspense". The episode "Marry for Murder" was broadcast on September 9, 1943. In 1944 Gish starred in an episode of I Was There, broadcast on CBS. The episode dramatized the making of the film The Birth of a Nation. On May 31, 1951, she starred in an adaptation of Black Chiffon on Playhouse on Broadway. The American Film Institute named Gish 17th among the greatest female stars of Classic American cinema. In 1955, she was awarded the George Eastman Award, for distinguished contribution to the art of film, at the George Eastman Museum's (then George Eastman House's) inaugural Festival of Film Artists. She was awarded an Honorary Academy Award in 1971, and in 1984 she received an AFI Life Achievement Award. 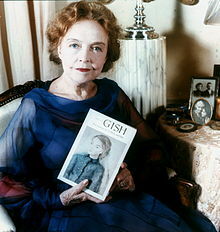 Gish, an American icon, was also awarded in the Kennedy Center Honors. In 1979 she introduced The Wind at a screening at the Wiltern Theatre in Los Angeles. She was a special guest at the Telluride Film Festival in 1983. Gish never married or had children. The association between Gish and D. W. Griffith was so close that some suspected a romantic connection, an issue never acknowledged by Gish, although several of their associates were certain they were at least briefly involved. For the remainder of her life, she always referred to him as "Mr. Griffith". She was also involved with producer Charles Duell and drama critic and editor George Jean Nathan. In the 1920s, Gish's association with Duell was something of a tabloid scandal because he had sued her and made the details of their relationship public. Lillian Gish was the sister of actress Dorothy Gish. She was a survivor of the 1918 flu pandemic, having contracted flu during the filming of Broken Blossoms. Gish learned French, German, and Italian during 15 years in Europe, which she first visited in 1917. George Jean Nathan praised Gish's acting glowingly—comparing her to Eleonora Duse. She maintained a close relationship with her sister Dorothy and with Mary Pickford for her entire life. Another of her closest friends was actress Helen Hayes, the "First Lady of the American Theatre". Gish was the godmother of Hayes's son James MacArthur. Gish designated Hayes as a beneficiary of her estate, with Hayes surviving her by less than a month. Gish was a devout Episcopalian. Gish was a staunch Republican, and was a strong supporter of Ronald Reagan in the 1970s. During the period of political turmoil in the US that lasted from the outbreak of World War II in Europe until the attack on Pearl Harbor, she maintained an outspoken noninterventionist stance. She was an active member of the America First Committee, an anti-intervention organization founded by retired General Robert E. Wood with aviation pioneer Charles Lindbergh as its leading spokesman. She said she was blacklisted by the film and theater industries until she signed a contract in which she promised to cease her anti-interventionist activities and never disclose the fact that she had agreed to do so. Lillian Gish died peacefully in her sleep of heart failure on February 27, 1993, aged 99. Her body was interred beside that of her sister Dorothy at Saint Bartholomew's Episcopal Church in New York City. Her estate was valued at several million dollars, the bulk of which went toward the creation of the Dorothy and Lillian Gish Prize Trust. A retrospective of Gish's life and achievements was showcased in an episode of the Emmy award-winning PBS series, American Masters. Lillian Gish is considered the movie industry's first true actress. A pioneer of fundamental film performing techniques, she was the first star to recognize the many crucial differences between acting for the stage and acting for the screen, and while her contemporaries painted their performances in broad, dramatic strokes, Gish delivered finely etched, nuanced turns carrying a stunning emotional impact. While by no means the biggest or most popular actress of the silent era, she was the most gifted, her seeming waiflike frailty masking unparalleled reserves of physical and spiritual strength. More than any other early star, she fought to earn film recognition as a true art form, and her achievements remain the standard against which those of all other actors are measured. Having pioneered screen acting from vaudeville entertainment into a form of artistic expression, actress Lillian Gish forged a new creative path at a time when more serious thespians regarded motion pictures as a rather base form of employment. Gish brought to her roles a sense of craft substantially different from that practiced by her theatrical colleagues. In time, her sensitive performances elevated not only her stature as an actress, but also the reputation of movies themselves. A street in Massillon, Ohio is named after Gish, who had lived there during an early period of her life and fondly referred to it as her hometown throughout her career. François Truffaut's movie, Day for Night from 1973, is dedicated to Dorothy and Lillian Gish. Gish's photo is mentioned as an inspiration for a troubled soldier in the 1933 novel Company K.
The luxury boutique hotel, Maison 140, in Beverly Hills, began its historic life as the home of Hollywood actresses Lillian and Dorothy Gish. In fact it was the Gish sisters who converted the mansion into a home for young actresses coming out to find their way in Hollywood. As they had hailed from Ohio they understood the comforts that would be missed from home while exploring one's dreams. The debut album of The Smashing Pumpkins, released on May 28, 1991, is entitled Gish in reference to her. Singer Billy Corgan explained in an interview, "My grandmother used to tell me that one of the biggest things that ever happened was when Lillian Gish rode through town on a train, my grandmother lived in the middle of nowhere, so that was a big deal..."
Lillian Gish: the Movies, Mr. Griffith and Me, by Gish co-authored with Ann Pinchot; ISBN 0-491-00103-7, W.H. Allen 1969, and ISBN 0-916515-40-0 Mercury House, 1988. Abel, Richard, et al. Flickers of desire: movie stars of the 1910s (Rutgers University Press, 2011). Berke, Annie, "'Never Let the Camera Catch Me Acting': Lillian Gish as Actress, Star, and Theorist", Historical Journal of Film, Radio, and Television 36 (June 2016), 175–89. Bogdanovich, Peter. A Moment with Miss Gish (Santa Teresa Press, 1995). Oderman, Stuart. Lillian Gish: A Life on Stage and Screen (McFarland, 2000). 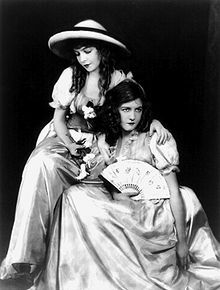 ^ Although there are unsupported claims that the Gish sisters were born with the surname "de Guiche", in fact their surname at birth was "Gish". According to Lillian Gish: Her Legend, Her Life (2001), a biography by Charles Affron: "The Gish name was initially the source of some mystification. In 1922, at the time of the opening of Orphans of the Storm, Lillian reported that the Gish family was of French origin, descending from the Duke de Guiche ... [S]uch press-agentry falsification was common." ^ "American Film Institute". www.afi.com. ^ Annie Berke, "'Never Let the Camera Catch Me Acting': Lillian Gish as Actress, Star, and Theorist," Historical Journal of Film, Radio, and Television 36 (June 2016), 175–89. ^ Birth year of James Gish. "Ancestry.com". ^ "Lillian Gish Biography". Bioandlyrics.com. February 27, 1993. Archived from the original on February 3, 2009. Retrieved October 4, 2010. ^ "Pennsylvania Births and Christenings, 1709-1950," database, FamilySearch (https://familysearch.org/ark:/61903/1:1:V2NJ-LPH : 11 February 2018), Jas. Leonidas Gish, 11 Dec 1873; Christening, citing ZION EVANGELICAL LUTHERAN CHURCH, HUMMELSTOWN, DAUPHIN, PENNSYLVANIA; FHL microfilm 845,111. ^ a b Charles Affron (March 12, 2002). Lillian Gish: her legend, her life. University of California Press. ISBN 978-0-520-23434-5. ^ Oderman, Stuart (2000). Lillian Gish: A Life on Stage and Screen. McFarland & Co. ISBN 9780786406449. ^ Charles Affron (March 12, 2002). Lillian Gish: her legend, her life. University of California Press. p. 138. ISBN 978-0-520-23434-5. ^ Lambert, Gavin (1976) . GWTW: The Making of Gone With the Wind (mass market paperback ed.). New York: Bantam Books. p. 53. ^ "She Was There (caption)" (PDF). Radio Life. January 16, 1944. p. 32. Retrieved April 18, 2015. ^ "Your Radio Today". Tucson Daily Citizen. May 31, 1951. p. 24. Retrieved May 10, 2015 – via Newspapers.com. ^ "AFI's 100 Years... 100 Stars". ^ "The AFI Life Achievement Award". ^ Lillian Gish: The Movies, Mr. Griffith, and Me, ISBN 0-13-536649-6. ^ "Lillian Gish talks with Studs Terkel on WFMT". Studs Terkel Radio Archive. January 16, 1963. Archived from the original on October 1, 2016. Retrieved September 29, 2016. ^ Sarles, Ruth and Bill Kauffman. A Story of America First: The Men and Women Who Opposed U.S. Intervention in World War II. Praeger, Westport, Conn., 2003, p. xxxvii. ^ "Overview for Lillian Gish". Turner Classic Movies. Retrieved November 12, 2015. ^ Royster, Jacqueline Jones (2003). Profiles of Ohio Women, 1803–2003. Ohio University Press. p. 224. ISBN 9780821415085. ^ Dixon, Wheeler Winston (1993). Early Film Criticism of Francois Truffaut. Indiana University Press. p. 46. ISBN 9780253113436. ^ March, William (1989). Company K. University of Alabama Press. p. 54. ^ "Luxury Beverly Hills Hotel - About Maison 140". www.maison140.com. ^ Caro, Mark (December 28, 1990). "Smashing Pumpkins Finds a New Home at Caroline Records". Chicago Tribune. Wikimedia Commons has media related to Lillian Gish.